At a time when efforts are being made in the West to bring back small retailers into the mainstream, the Indian government has come up with a study that lauds the role of big retail chains. It claims that the growth of supermarts in India will not harm street vendors and small shop owners, and will only spur a healthy competition in the retail sector. "Both unorganized and organized retail are bound not only to coexist but also achieve rapid and sustained growth. Both will see a massive scaling up of their activities. In fact, the retail sector, left entirely in the unorganized and informal segment of the economy, could emerge as a major bottleneck to raising productivity in agriculture and industry," states the study, Impact of Organized Retailing on Unorganized Sector, commissioned by the Department of Industries Planning and Promotion, commerce and industry ministry. The government asked the Indian Council for Research on International Economic Relations (icrier) to carry out the study after protests in a few states last year against new grocery and fruits and vegetable retail chains. Several development observers and economists, however, do not agree with the study's conclusions. They say small retailers are already being edged out by organized retail houses, especially because the government's policies are biased against the unorganized retail sector that employs about 30 million people. After farming retail is the biggest occupation in India. 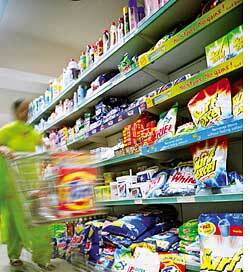 The study estimates that the total retail business in India will grow at 13 per cent until 2011-12. The unorganized retail sector is expected to grow at approximately 10 per cent per annum. Organized retail, which constituted 4 per cent of the total retail in 2006-07, is estimated to grow at 45-50 per cent per annum and attain a 16 per cent share of the total retail by 2011-12, says the report. At the same time, it notes, 4.2 per cent of small retail shops close down every year and 1.7 per cent of them close down because of severe competition from retail chains. The study stressed that small shop and retail dealers will make losses initially and in five years will come up with innovative techniques to survive alongside organized retail. "Even in the medium run I don't see a positive spin-off," says Praveen Jha, associate professor, Centre for Economic Studies and Planning, jnu, Delhi. The study was conducted in 10 cities over 14 months and surveyed 2,020 small traders, 1,318 consumers, 100 intermediaries and 197 farmers. The organized retail chains studied include Subhiksha, Mother Dairy, itc Choupal, Trent ltd (Westside, Star India Bazaar), Futures Group and Spencer's Retail, but none of the new ones, like Reliance Fresh, More and 6 Ten that have penetrated small cities, was included. Reliance Fresh was the target of protests in Uttar Pradesh that lead to the study. Advocacy group ACORN-India FDI Watch, which, with Navdanya, studied the Paharganj, Nangloi and Lakhshmi Nagar areas of Delhi, contends that supermarket chains have an immediate and considerable impact on small players. "Many could not compete even for a month," says Dharmendra Sharma, director, ACORN-India FDI Watch. "All these chains are following the Wal-Mart strategy of predatory prices, that is to sell at low prices initially and when you have established a monopoly, reverse the trend. Look at what they have done in India; they have introduced 'predatory' prices on things like onion, potato and tomato, while making other vegetables expensive, but the impression is that vegetables are cheaper in these shops. And when one comes to these shops in a car, he will not go out with just onions but a lot more," he says. The icrier report shows how this strategy is working in India when it mentions that low-income consumers save more than others by shopping at organized retail outlets, whereas overall consumer spending has increased with the entry of the outlets. "This is a result of targeted discount shopping," it says. The study has applauded Wal-Mart. "Wal-Mart had become the largest private employer in the world with two million employees. The company's annual revenue totalled us $350 billion in 2006," it says. As Wal-Mart is set to enter the Indian market, with Bharti Group tying up with it, the study ignores cases of the retail giant monopolizing the market and killing local manufacturing industry by sourcing most supplies from China. "The organized sector will similarly open a giant pipeline of cheaply sourced goods from China, Thailand and asean, leading to a massive livelihood loss in the indigenous manufacturing sector and small-scale industries," adds Sharma. Take Iowa state in the us, for instance. Wal-Mart wiped out 43 per cent of its apparel stores and 37 per cent of its grocery stores between 1983 and 1993. But organized retail stores in India are still far from employing Wal-Mart's strategy, says Madhu Kishwar, senior fellow at the Centre for the Study of Developing Societies, Delhi. "Land is expensive in India. These stores are in stinky small places. They need ac s to run their store and a cold storage chain to keep their supplies from perishing and then there is the parking problem. So how can they provide goods cheap? If one thing is cheap, the other is expensive," she says. The icrier study calls for modernizing vegetable markets through public-private partnership and facilitating formation of farmers' cooperatives to directly sell to organized retailers. The study also recommended formulation of a "private codes of conduct" by the organized retail for dealing with small suppliers and simplification of the licensing and permit regime for the organized retail. According to Kishwar, even if half the facilities provided to the organized retail are given to the street vendor, things will be much better. "Provide a level playing field to street vendors and then see who comes out the winner. Legalize street vendors, give them space to sell and other amenities as per the national vendors' policy and they will be better retailers then any of these stores. At present, half their income goes into paying bribes to the police and goons," she says. The National Policy for Urban Street Vendors was drafted in 2004 but has not been implemented. The draft policy aims at making street vendors an integral and legitimate part of the urban distribution system. The study admits that regulatory restrictions on the growth in modern retail are more stringent in developed countries. "In most West European countries setting up of hypermarkets has become very difficult since the late 1990s as governments became alive to the demands of small retailers and non-mobile consumers. Merger and acquisition plans are looked at more critically by competition authorities," it says. "In Germany efforts are being made to bring small retailers back into the mainstream by giving them training and other support mechanisms. I don't think in India we are even looking at all that. Even in the us, there are studies damning big retail chains. So when developed countries are not able to handle this phenomenon, how will developing counties, where there is so much labour surplus, do so?" asks Jha. "According to the Census 2001, there are 26.9 million main and 2.4 million marginal workers in wholesale and retail trade. Of these nearly 17 million are not even matriculates. If we count the dependents, at least 120 million will be impacted by the retail revolution created by big corporations," says Sharma. While the report cites positive spin-offs of the organized retail--investment in support industries like information technology, warehouse, distribution services and agro-processing--critics warn against climate impact of these amenities. "For refrigeration of vegetables and fruits and for air-conditioning the retail outlets will need at least 20,000 megawatt of energy," says Sharma. But, of course, no one is factoring this cost.